I remember the 6th edition Beasts of Chaos book way back when, with its combined forces of all things monstrous. It's been quite awhile since the wild creatures of chaos have been united under one book, but now it's back for AoS! So what secrets do the true children of Chaos hold? The cover on this is pretty nice, with a gor front and center. It's an art style that I definitely like, and if it's not Alex Boyd, it's definitely close to his style. I feel this really captures the grittiness of Warhammer. The only slight downside for me on this is that I feel like it all has a bit of a grey feel to it. Like it's all been desaturated. I'm more of a fan of covers that are bright and vibrant and really grab your attention, but I suppose it's fitting that the Beasts of Chaos have a more naturalistic cover. Once you crack it open there is a little intro page tailored specifically to the army, just like with the Nighthaunt and Stormcast books. I'm really enjoying these and they add a nice little touch to the book if you read it from front to back. It's almost like a little teaser before the main title of the movie pops up on the screen. From there we dive into the broad strokes of the army. 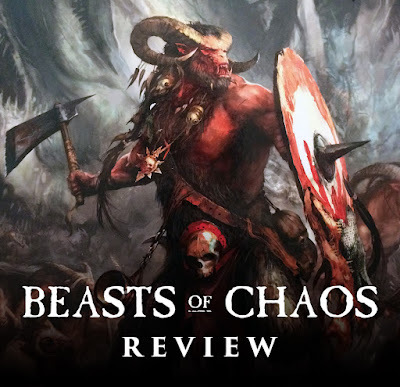 Essentially the Beasts of Chaos consist of any and all monstrous creatures touched by the gods, but the main groups fall into the Brayherd, Warherd, Thunderscorn, and assorted monsters and gribblies. The Brayherd are your beastmen, which are typically a beastial lower half, with the torso and arms of a human and the head of a beast. The most common variety of these are goat-like in nature, though it mentions that beastmen can be any combination of man and animal, and some just have waving tentacles and pseudopods for limbs. Most interesting it mentions beastmen with fish heads and warherds that are half shark encountered by the Deepkin in the depths of the oceans. I know this is just a throw away line, but it would be awesome to see someone convert this up. Especially the shark based warherds. In fact, it would be jawsome! Warherds are just the larger, and more aggressive cousins of the beastmen. They're your bullgors, Ghorgons, Cygors, and Doombulls. Beyond just being larger, they have an insatiable hunger for flesh. It basically describes them as being unstoppable juggernauts of ravenous violence. The Thunderscorn are the Dragon Ogors and Shaggoths, and inhabit the high places of the realms, coming down from the mountaintops to destroys all around them. Lastly are the other monsters of Chaos, such as the Chimeras, Hounds, and Cockatrices drawn to the armies of the Beasts of Chaos. The largest of these armies are called greatfrays. Each greatfray can consist of any number of beastherds which are usually centered around one faction of the fray, such as Brayherd or Thunderscorn, but they're at their most effective when they combine their might. 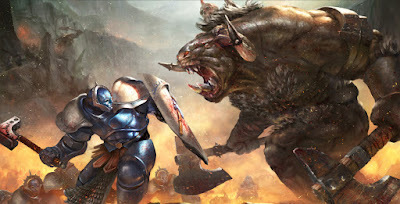 These armies are held together by the power of an alphabeast, a particularly powerful leader, who holds onto their position through might alone. In fact, it's expected for that position of power to be challenged, for if the alphabeast can't defeat their challenger then they don't deserve to be in charge. It also goes over the origins of the Beasts of Chaos in a rather interesting way. The only thing that is known for certain is that the greatfrays existed in the Mortal Realms before Sigmar's arrival. In fact, they pretty much held dominance in the realms, preying on the weaker, isolated tribes of men, duardin, and aelf. Once the Age of Myth began and the civilizations and empires began to grow they were pushed to the wilds of the realms. To them order and civilizations are anathema, and they want to see everything devolve into chaos again. Alongside this we are presented with three possible origins for the Beasts, as posited by the civilizations they hate. One has them coming from a giant beast in Ghur, possibly a godbeast, another that they were once natural beasts mutated by the warping winds of Chaos which bled into the lands. The last comes from a society that clearly hold some pretty messed up beliefs who think the beasts came from a lack of segregation. Don't worry though, this very kingdom later falls early in the Age of Chaos because they pushed away all their allies with their views, and as we learn in the timeline section, they're fall is accompanied by devolving into Beasts of Chaos themselves. Oh the delicious irony. The Beasts of Chaos consider themselves the true children of Chaos, a conceit carried over from their past army books. They don't worship Chaos or any of the gods, but instead embrace the ethos of it. They wish to see everlasting anarchy, and true anarchy can have no gods controlling them. They even see the demons of Chaos as lesser since they are beholden to their master's will. There are certain Beasts of Chaos who will dedicate themselves to one god over the others, but they are commonly seen as being weak for doing so and either killed or cast out. Sometimes though, when they are powerful enough, they can rise to power of an entire beastherd or even greatfray, and turn it to the worship of one of the four gods. Each of the major three factions, Brayherd, Warherd, and Thunderscorn get their own section, going over what they're all about. The Thunderscorn are the most interesting to me for a few reasons. Out of all of them they hang onto their world-that-was origins, with mention of a particularly large Shaggoth surviving that world's destruction and siring the race in the mortal realms. What I really liked though is that before Sigmar's arrival they made their home in Azyr, which makes sense since they're all about high mountains and lightning. When Sigmar purged Azyr of all Chaos taint they were forced out and are now determined to get back to their ancestral home. We also get a description of the center of life for the Beasts of Chaos, the herdstone. It gives you a couple ideas for non-traditional herdstones, such as ones made of living meat for the Warherds and other cool ideas. We get a small section on how the greatfrays and beastherds are organized, but it's pretty much what you would expect; might makes right. Nonetheless, it's still interesting to read. 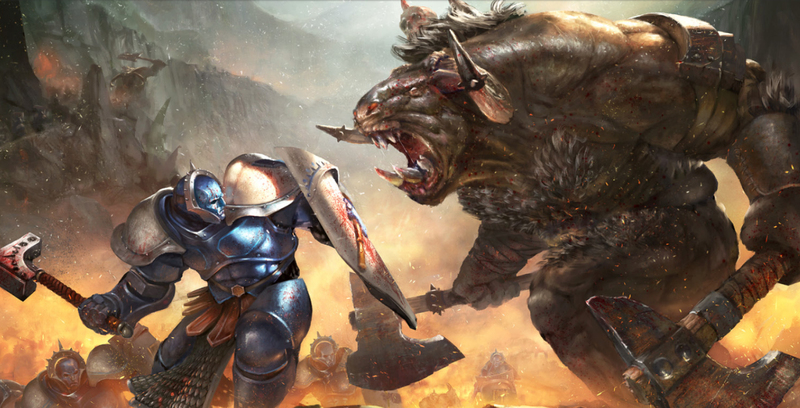 The timeline section covers some major events, such as Sigmar's purge of the Thunderscorn, the beasts' rampage during the Age of Chaos, as well as some events familiar to those who followed the Realmgate Wards books, such as the Nurgle brayherd in Ghyran that fought Lorrus Grimm. The necroquake is covered here as well, with the Shyish nadir drawing the greatfrays to it. It's the fear of Azyr that the beasts intend to desecrate the Black Pyramid, turning it into the ultimate herdstone which would unleash unstoppable anarchic magics. The three major greatfrays, Allherd, Darkwalkers, and Gavespawn each get their own description here as well. The Allherd are the largest and most dominant of the greatfrays and are found in all of the realms. When you think of the standard Beasts of Chaos look you're thinking of them. To me the Gavespawn are the most interesting. They "worship" Morghur, a character that long time fans of Warhammer may remember from the world-that-was. 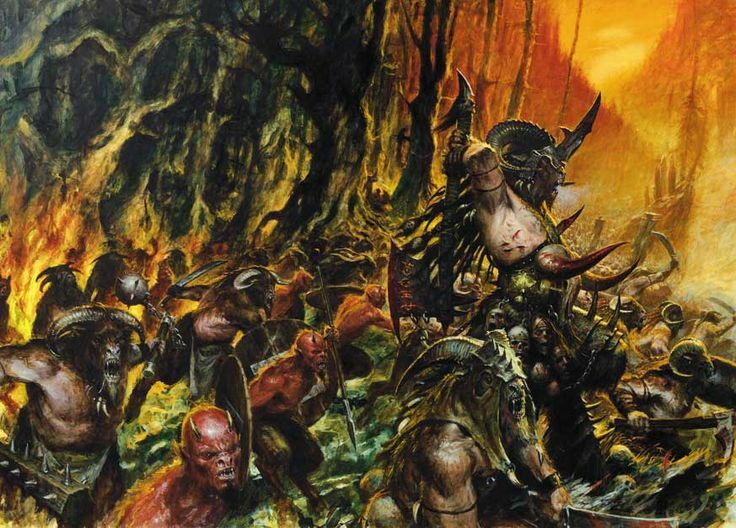 It's stated that the Chaos gods saved him from destruction inside the realm of Chaos, and now his followers in the mortal realms are attempting to bring him back through to the material plain. They're all about mutations unleashed and make use of a large amount of Chaos Spawn. We also get a brief look at the types of greatfrays that are dedicated to a specific god and why they might have done so. Slaanesh is pretty cool, since the beasts in those greatfrays have a secret love of the trinkets and art made by the civilizations they despise and seek them out. They then go through a cycle of self hate as they deal with the idea of desiring that which they should destroy. It's an interesting little hook. Now we get into the individual unit descriptions. If you're familiar with the units that make up the Beasts of Chaos already, there's not a ton here that you probably don't already know. It's still a fun read though. It gives some origins for monsters like the Ghorgons and Cygors (both originating from Bullgors who either ate too much as part of their bloodgreed or ate to many magic users), and the Chaos Gargants. If you're brand new to the army though this will be great for you, as each unit gets at least a paragraph or two, like the Gors and Ungors, while some get whole pages to themselves such as Beastlords and Shaggoths. One common theme I picked up on is that the Ungors really get the short end of the stick. Long story short, they're used to make all the weapons and chariots, and then are usually killed by their larger cousins for the effort. Hence why they hang around in such large packs, to protect themselves. Even the Tzaangors get revisited here, with a decidedly more bestial spin with mentions of their own form of herdstones, the flux-cairns. I'm still super tempted to do an almost all Tzaangor themed beast army. The gallery section of the book is a little shorter than others, but the photography is just as great as always. I really love the mood they achieve in some of their diorama photos, though I think the Legions of Nagash and Nighthaunt books still top the chart with best use of lighting. They even have painted examples for a bunch of different types of Gors such as ones dedicated to Nurgle, or hailing from Shyish or Aqshy. The Aqshy one is particularly cool and I would love to see someone do an army in that style. Just like all of the other recent books, we also get a short hobby section, with some painting tips for various things. The three main greatfrays are covered as well, with step by step guides for their schemes. Now we come upon the rules. First, and most iconic for the Beasts of Chaos is the herdstone. Now that there is finally a model for this it's gotten some updated rules to reflect it. It's set up just like most of the other army specific terrain pieces, but has to be in your territory, and 12" away from your enemy's territory. The warscroll for it has a 6" bubble around it that subtracts 1 from the armor save of all models except for Beasts of Chaos and makes the Beasts immune to Battleshock. Each turn after the first this bubble grows by another 6", so by the end of turn 5 it will be a 30" bubble. This is pretty good, but won't have a super huge effect until about midway through the game once the bubble has grown a bit. It's 0 points though and looks pretty cool, so no complaints there. After that each of the main factions gets its own little allegiance ability. Brayherd gain the ability to ambush, coming on from any table edge as long as they're 9" away from the enemy. Warherd units heal D3 wounds any time they wipe out a unit, and Thunderscorn get to move an extra D6 inches every hero phase as long as they're more than 3" away from an enemy. Best of all, you can mix and match units and they still all retain they're allegiance ability! That means you can have some ambushing Brayherd while you Thunderscorn race up the center and your Warherds chow down on some unfortunate victims. Lastly, there is a summoning mechanic similar to what we've seen with other Chaos armies. You earn 1 Primordial Point per turn, which you can use to bring on summoned units from the table edge once you've collected enough. Your Bray Shaman can also inflict D3 mortal wounds on a friendly unit near a herdstone to generate more. This represents them calling on more reserves from the wild. For command traits and artifacts you have three sets of each, one for Brayherd, one for Warherd, and one for Thunderscorn. Some of my favorites are the Gorger command trait for Warherd which lets all Warherd units wholly within 12" heal 3 wounds instead of D3 from Bloodgorge, the Knowing Eye artifact for Brayherd which generates an additional command point each of your hero phases on a 4+, and Ancient Beyond Knowing command trait for Thunderscorn which gives you D3 additional command points at the start of the game. With a total of 36 command traits and artifacts to pick from you'll have plenty of choices. There is a spell lore of 6 spells for the Brayherd and a Thunderscorn spell lore of 3 spells as well. I really like Tendrils of Atrophy since it makes an enemy unit's armor -1, which can be stacked with the herdstone's ability. Each of the three main greatfrays are represented here as well. They cost 0 points and you just need to pick which one your army is going to be, similar to the Stormhosts in Stormcast. Each one has an additional ability, command ability, and then a new artifact and command trait that you're required to take. The Allherd will be a top pick for people who like summoning since it's command ability gets you an extra Primordial Point. Darkwalkers will probably be popular as well since it allows Warherd and Thunderscorn units to ambush alongside the Brayherd. There is a scenario unique to the army centered around an invading army trying to destroy the herdstone. It looks pretty fun and limits charge and missile ranges, meaning you'll have to get in close to do the majority of the fighting. This will definitely help the Beasts of Chaos stay alive a bit longer. There is also a Path to Glory section similar to what we've seen from other Battletomes. The Beasts of Chaos get eight Warscroll Battalions to choose from. The first three focus on each of the distinct factions within the army, one for Brayherd, one for Warherd, and one for Thunderscorn. They're all pretty good, with the Warherd battalion allowing your models from it to pile in an extra 3" which will come in handy on their larger bases. The fourth one, the Desolating Beastherd, is my favorite and probably the one you'll see the most. It contains a little bit of everything, and if you don't include any of the Monsters of Chaos, such as Chimeras or Chaos Hounds in your army you can probably fit the entire thing into this battalion. The ability is also really good and rewards you for being aggressive, making an unmodified hit roll of a 6 while in the enemy's territory into 2 hits instead of 1. The last four center around the different Chaos gods. This is how you can give your models marks of Chaos. They each have a list of units that can be taken in them, Tzaangors are only in the Tzeentch one for example. This list is pretty large and flexible, so again, you can probably fit your whole army in if you want. They each then have an ability, like Tzeentch units from it being able to unbind spells like they were a wizard, and then all units in the battalion also gain a mark. I'm not going to spend a ton of time on the unit Warscrolls since you can see these for free on the App, but I will touch on a few. There are no new units in the army, so everything in here is an updated version of an older scroll besides the Endless Spells and herdstone. Everything has been tweaked a little bit, some more than others. The dreaded Tzaangor Skyfires have finally been addressed, with their mortal wound shooting attack only being on an unmodified 6 now, so no way to buff it. Tzaangor Enlightened also finally have a separate points cost for being on foot as opposed to on the disc. I personally like the idea of a large unit of Enlightened on foot, ambushing (cause they're Brayherd now too) and chopping stuff up. Bestigors now get bonuses against larger units and order units instead of just units with banners, and the Bray Shaman has gotten a nice boost as well. The book is rounded off with the three new Endless Spells. I think the Wildfire Taurus looks the coolest, and is no slouch in the game either, but my favorite is the Dirgeblast Doomhorn. All units within 3" of it subtract 1 from their hit roll besides Beasts of Chaos, and that bubble grows 3" inches each turn just like with the herdstone. It's not a predatory spell either, so you don't need to worry about it being turned against you at all. The points have all been adjusted a bit, with most of them going down a bit, like the Bullgors and Skyfires, and the Bray Shaman going up a bit. Their only ally choice is Slaves to Darkness, so no demons or anything. If you're a fan of the Beasts of Chaos then you'll be bleating with joy about this. It's really everything you could want, and it's really nice seeing this army get their own Battletome since they missed out on an updated book in 8th edition as well. The art is cool throughout, though I think most of it is from older books, but it was new to me. For non Beasts players this is still a cool addition with some cool new lore on the true children of Chaos. Like I said, I've been tempted to start a Tzeentch themed force. I really like the new Tzaangor models, as well as the herdstone and new spells. I'll be able to double at as a Disciples force too if I want.